Nicolas Cage may have left the building, but that doesn't mean the Ghost Rider isn't looking for action. Click here to play! Join this flame-headed, motorcycle-riding vigilante and reap the benefits of riding pillion with such a character. Ghost Rider is a colorful, 5-reel slot machine that is played across 25 lines, with the more lines made active increasing your payout odds on winning combinations. Your enemies are countless, but they all pay out well when you spin up enough of them. The Ghost Rider symbol is Scattered and will send you to the Bonus Round if three or more are discovered. Once inside the Bonus Round, you have to help the Ghost Rider rescue people trapped inside cars for cash. The Ghost Rider himself can be Substituted for any other symbol on the reels except Scatters, and will pay out up to 10,000 times your initial wager. Join the man of fire, Ghost Rider, today for your chance at exciting action and massive winnings! 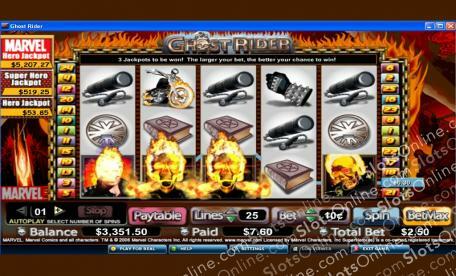 The Ghost Rider logo is Scattered and, besides paying out at up to 100:1, it will send you to the Bonus Round when three or more appear on the reels. The Ghost Rider can be substituted for any other symbol in the game except Scatters, and pays out up to 10,000:1. Three Scattered logos will send you to the Bonus Round where you must at the Ghost Rider in saving people trapped in cars. There are bountiful rewards if you are successful.